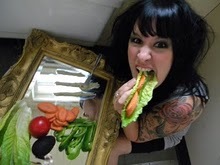 One of my favorite bloggers is a raw food blogger named Addicted to Veggies (ATV). She recently mentioned wanting to earn income for the hard work she puts into her amazing original raw food recipes. So, I started thinking about keywords for her blog. Later that week, I came across a raw food site called from Sad to Raw that had a banner at the bottom advertising, “#3 for the search Raw Food Recipes”. I thought, wow that’s perfect for ATV! Even if you’re not into raw food, you should follow Addicted to Veggies on Twitter because her recipes are amazing, healthy, fun, and beautiful. So, I used the Google keyword tool to search for the phrases raw food recipes and raw vegan recipes. I set the search to “exact match” and I was quickly amazed by how many people were searching for these terms. While the other websites in the searches are optimized, ATV has a great blog, and she draws a lot of links, attention, and support from her fellow bloggers. She certainly has better recipes than the other sites listed. So, to take advantage of raw food recipes, she should title her home page, Raw Food Recipes by Addicted to Veggies. If she doesn’t want to place her brand second, then she should create a post titled “Raw Food Recipes” and link to it in a couple of places on her blog’s home page. The next step is to get as many links pointing to her website to say “raw food recipes” or a variation on that theme like “raw vegan recipes”. A few short emails to her close friends linking to her should do the trick. *Note to ATV: if you create a sub-page for raw food recipes, let me know and I’ll update the links in this post to point directly to that page.